These three oils can be used against constipation. Ricinus (or castor) oil is an important raw material in lubricant production, Jatropha curcas oil is a new bio-diesel and Croton oil is a dangerous medicine. 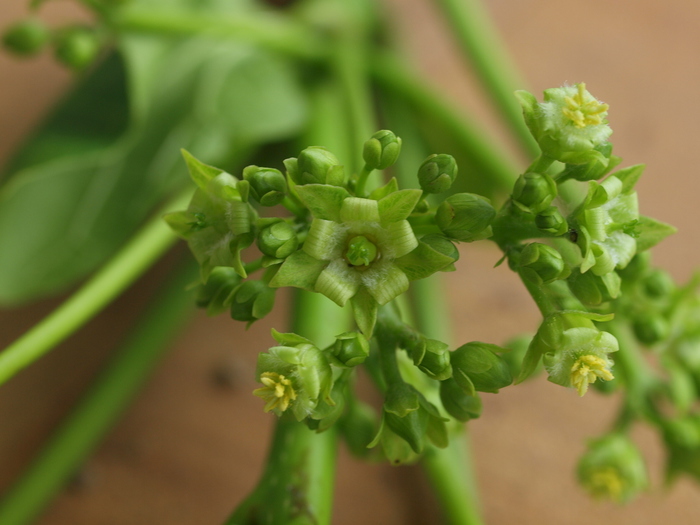 The Euphorbiaceae, Spurge family counts more than 6000 species in 300 genera. Thailand has more than 450 species in 87 genera. The family has a worldwide distribution except Antarctica. This family has many plants with abundant milky juice or watery sap, often irritating and toxic. The flowers are most small. 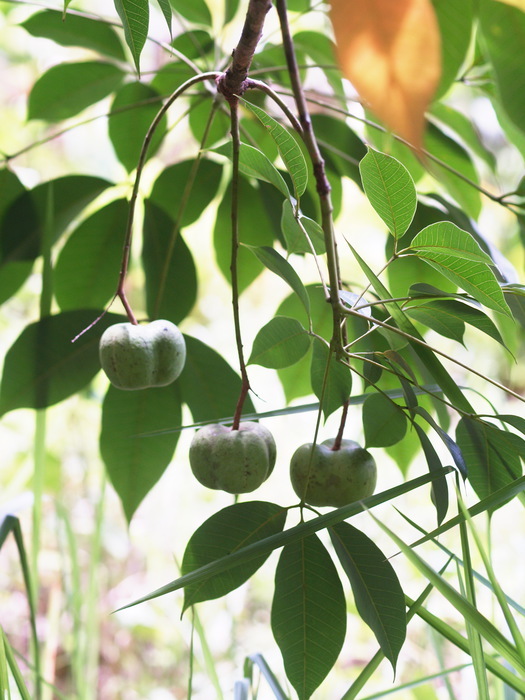 The fruits are usual capsules with 3 compartments, each with 1 or 2 seeds. 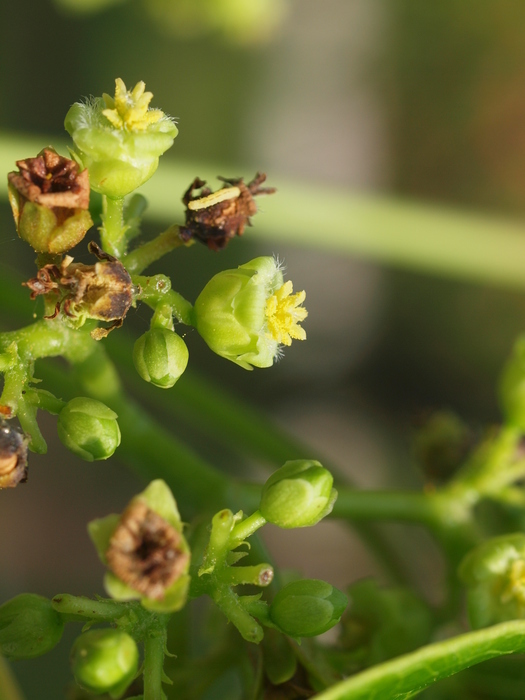 The ripe capsules break open with a crack and some species shoot their seeds for more than 50 meters away. Sometimes the fruit is more like a berry, with an edible fleshy and juicy layer around the seed. This family has many plants used for medicine, wood, dyes, rubber, oil, food, fruits and as ornamental plants. 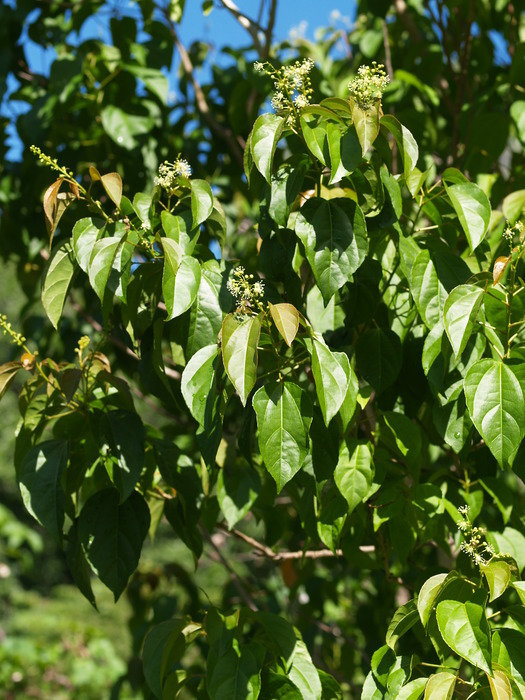 These oil plants are small trees or shrubs up to 6 m; the seeds contain highly toxic proteins. Consumption of a few chewed raw seeds can be deadly. The remainder of the pressing cook of the seeds is only useful as fertilizer unless detoxified. 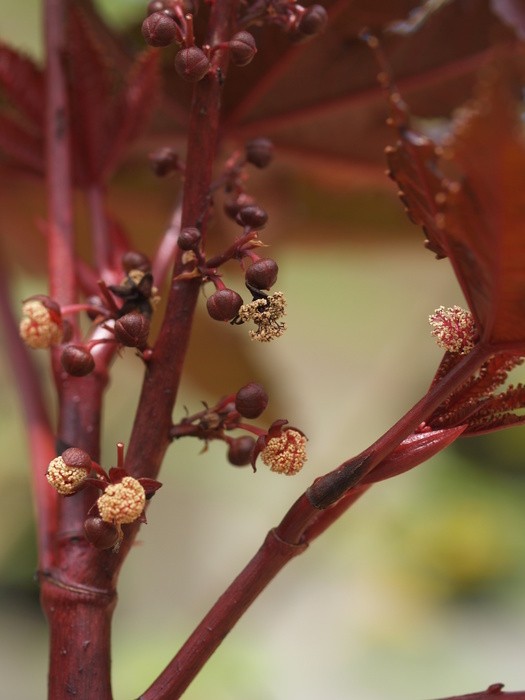 Ricinus has only one species Ricinus communis.The origin of R. communis is E. Africa. The pressed oil from the seeds is called castor oil or wonder oil. 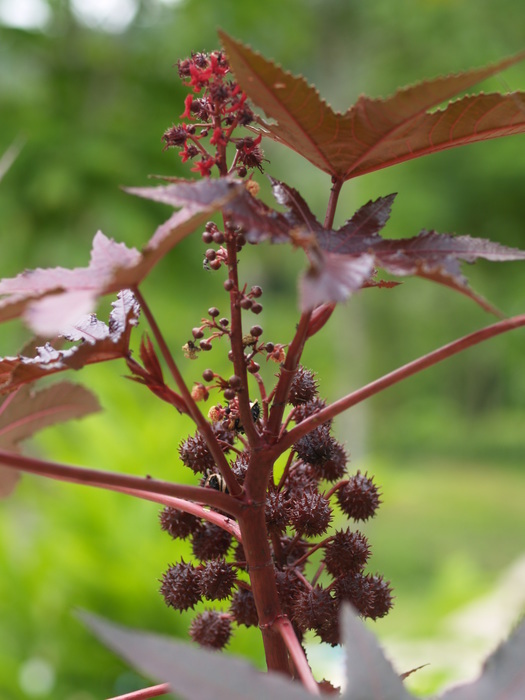 Ricinus oil is a none drying and non-edible, very viscous oil. The oil is soluble in alcohol, not common for natural oil, but not mixable with light petrol. For medicinal and food processing purpose the caster oil should be pressed cold to prevent introduction of toxic compounds. The main fatty acid in the oil is ricinoleic acid, an unsaturated fatty acid with a hydroxyl group in the molecule. Medicinal the oil is a useful a laxative agent. It has been used in medicines inducing abortion or labour in pregnant woman. By the natural digestion of the oil the fats broken down to glycerol and ricinoleic acid. Ricinoleic acid irritates the mucus layers in the intestines and so speeds up the propulsion of its contents. The oil is also used as oil for injection and in eye drops. The oil is used in cosmetics as filler for nail varnish, lipsticks, shampoo and hair creams (grease). Ricinoleic acid can be used as a spermicidal in contraceptive gels and crèmes. Ricinus oil is far more important as lubricant. It has a high viscosity over a wide temperature range and is used as a high quality lubricant under extreme conditions like the arctic or in airplanes. Highly purified oil is used to lubricate food-moulds and food processing machines. The processed oil is the major component in hydraulic- and break oils. The cracked oil delivers further products for lubricants and polymers. The seeds contain a toxic protein 'ricin', especially when injected directly in the blood stream, 1 mg is lethal. Ricin is the supposed active ingredient in the "umbrella murder" in London in 1978. A Bulgarian journalist was killed after a sting with an umbrella. The umbrella was used to inject a small bullet with ricin as poison. Since 1994 ricin is considered as a potential chemical weapon. 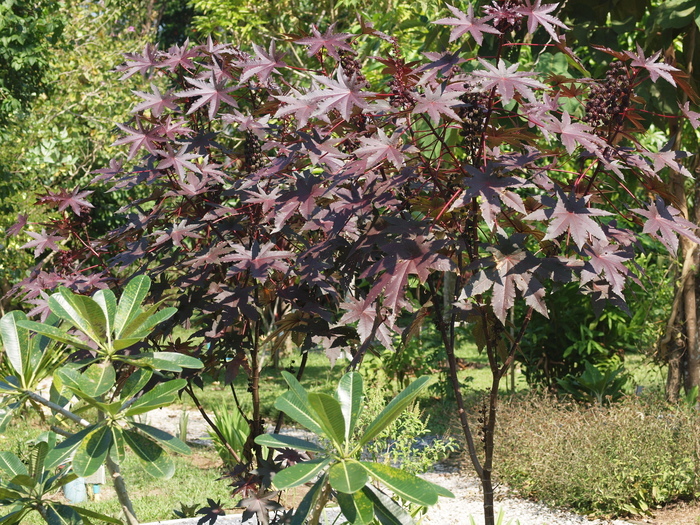 The plant with green, red or brown leaves is nice garden plant. In colder regions it is grown in summer as an fast growing annual ornamental plant. 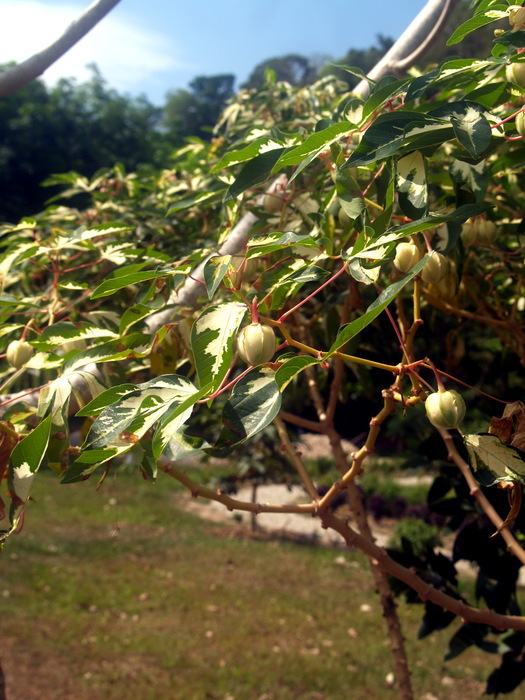 Jatropha curcas Thai name สบู่ดำ (sabu dam) purging nut, physic nut (Eng. ), purgeernoot ( Dutch). Jatropha is a mostly South American an African genus with 175 species. Thailand has 5 imported species. J. curcas is planted as a living fence and cultured for the oil. The other species are ornamental plants, sometimes also used as medicinal plants. As the name of the seeds (no nuts) implies it good purging and emitting agent. The oil will also repels worms, but is actually too toxic to use for medicinal use. The oil of J. curcas has a new application: it is used as bio-diesel. 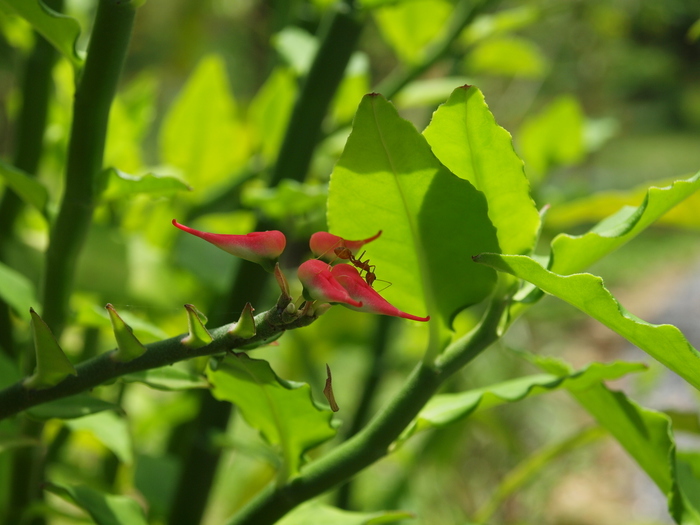 The shrub grows well in dry regions, so it could be an interesting economically crop plant in dry areas. As a non-food oil preferable above fueled food like palm oil or corn alcohol to dilute gasoline. Hopefully the cultivation of this plant will not have the same destructive impact on the natural forests as the rubber tree and oil palm. 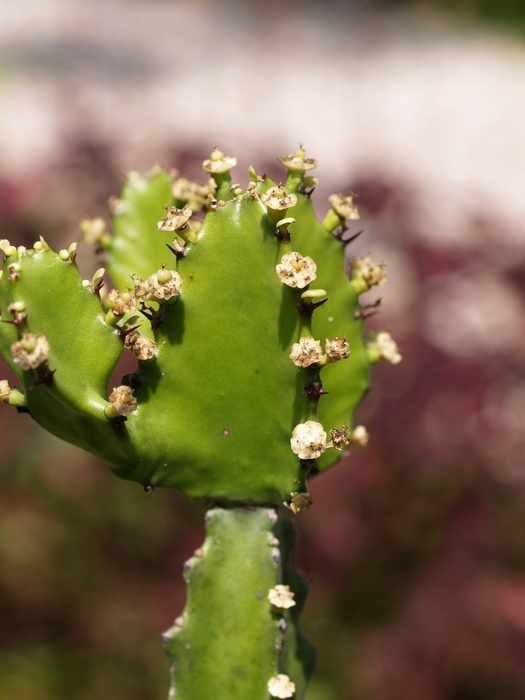 In the traditional medicine, the clear sap of the plant is used to arrest bleeding, to treat ulcers, cuts and abrasions. It is said that the sap works by forming an airtight film after drying, like collodion. The Thai name can be translated as 'black soap'. If you break a leaf and you blow in the right way over the gap you will see soap bubbles flowing off. The plant contains saponins, they can be used for washing cloths but are very different from normal soaps. It is possible to make a dark blue dye from the bark. The fresh stems can be used as toothbrush to strengthen the gums and to cure bleeding gums. 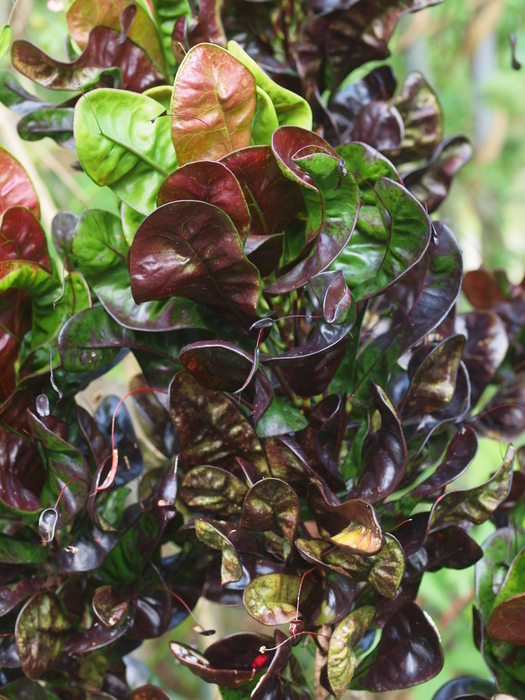 Croton tiglium Thai name สลอด (salohd) croton. Croton is a pan tropical genus with more than 800 species special in tropical America. Asia has about 100 species, Thailand 31. 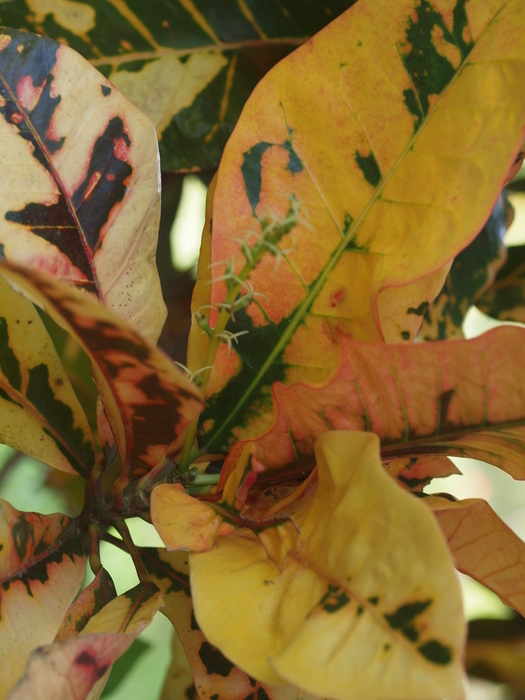 Croton tiglium should not be confused with Codiaeum variegatum, an ornamental species in the this family, called croton in garden language, with showy leaves in many forms and colors. 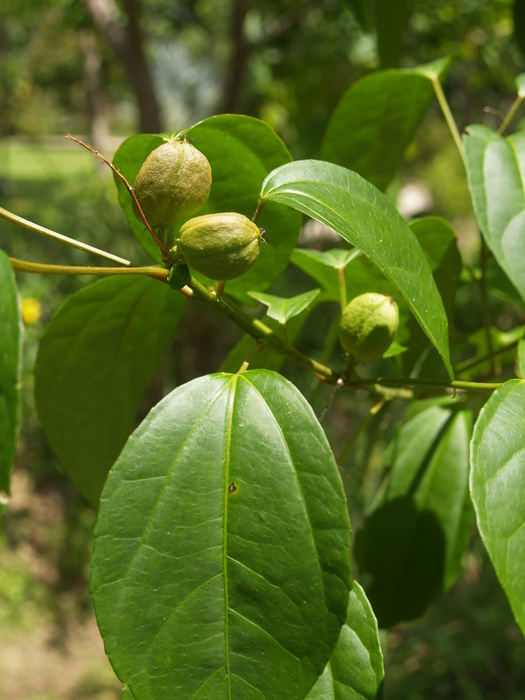 The oil of the seeds was formally used as extreme laxative in very persistent constipation. On the skin the oil is very irritating causing sever itch and after some time bladders and pustules. Croton oil contains 5% resinous material. This are esters of euphorbol, a mixture of irritating, toxic and cancer promoting chemicals. These compounds make the milky juice of many plants in the Euphorbiaceae toxic and can cause blindness. The seeds (and oil) of C. tiglium contains insecticides, and these are also useful in catching fish as well. 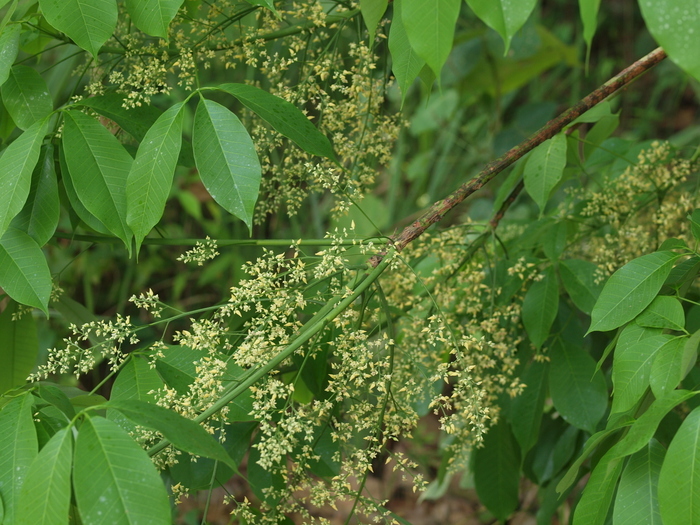 The dried crushed leaves are used as a purgative medicine, and externally used by snake bites. Because the toxicity of all parts of the plant, including roots, it is better to consider this tree as nice ornamental plant but too dangerous medicinal plant for man and cattle. In the garden you will find numerous weeds and 30 labeled plants in 16 genera in. 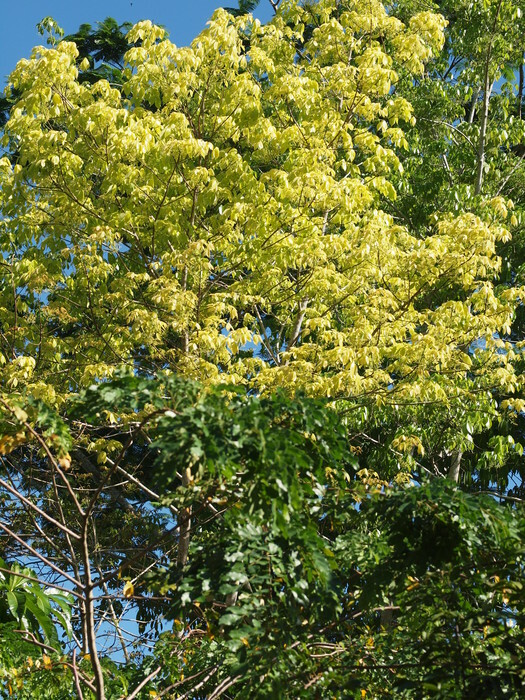 Hevea brasiliensis Thai name ยางพารา (jaang para) the para rubber tree. 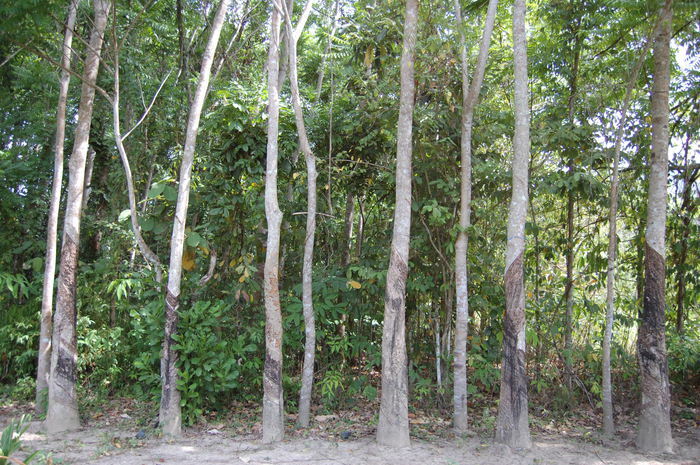 The milk sap of this tree is the source of most of the natural rubbers in the world. The milky juice of the rubber tree is a special case within this family: it is not poisonous. Together with Elaeis guineensis Thai name ปาล์มน้ำมัน (pam namman) oil palm these are the two most common plants seen in huge plantations in S. Thailand and further to the south. 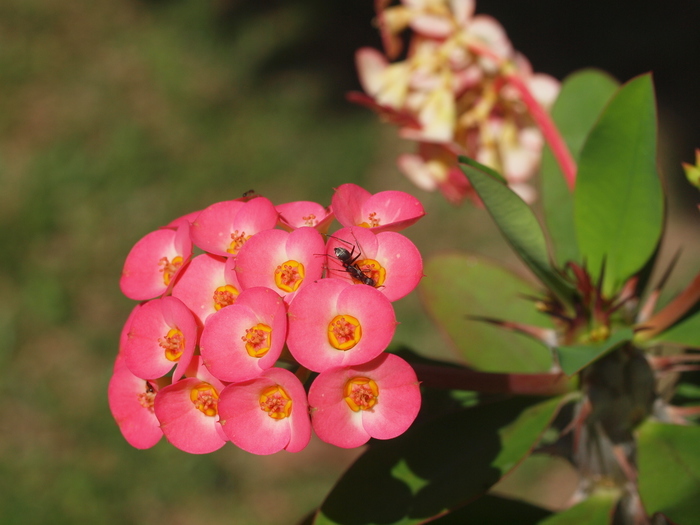 The genus Euphorbia has more then 2000 species, from herbs, to trees or succulent plants with usually abundant, mostly toxic milk sap. What seems to be an common flower is actually an collection of one central female flower surrounded be an number of male flowers. The male flowers are reduced to one single stamen. This collection of mini flowers is enclosed by bracts than can bear honey gland or other attributes. The name for this pseudo flower is called an cyathium. All species have white latex and mostly all with toxically euphorbol compounds. Euphorbia antiquorum Thai name สลัดไดป่า (salad dai pa) very common succulent on the steep cost cliffs around Aonang. 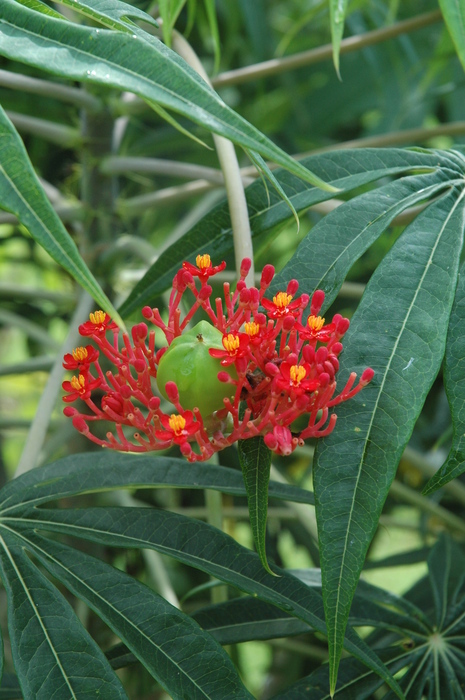 Jatropha multifida Thai name มะละกอฝรั่ง (malako farang) coral tree, physic nut. Thai name can be translated as westerly papaya. Also used medicinal plant. Manihot esculenta Thai name มันสำปะหลัง (man lam pa lang) cassava, tapioca or manioc. Manihot is an genus with 100 species in (sub)tropical America. M. esculenta is economically an important staple food plant for the starch in the swollen root tubers. All parts of the plant emit (hydrogen) cyanide. Wrongly prepared food of this plant can be your last meal. 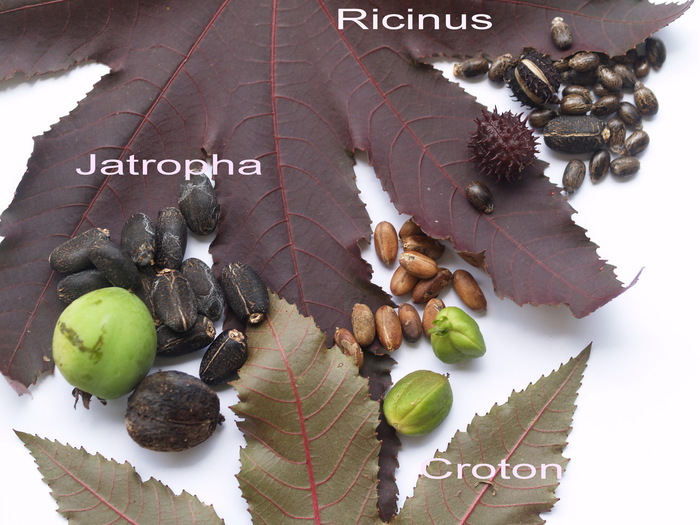 Most information is to find in Plant resources of South-East Asia Vol 12(1): Medicinal and Poisonous plants for Croton and Jatropha; Vol 14, Vegetable oils and fats for @Ricinus.